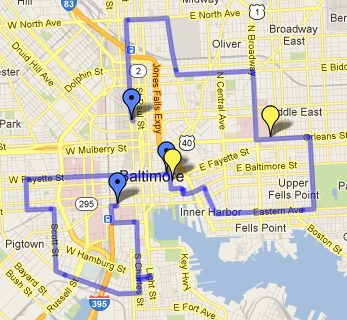 1- http://goo.gl/maps/wFeUx here is the route for this month! highlights include the hopkins dome, patterson pagoda, little italy, city hall, poe’s grave, the b&o museum, and more! 2- please congregate on the NORTH park of the monument! the west side is fenced off to let the grass grow. also PLEASE stay out of the street while we are gathering! 3- we will be leaving PROMPTLY at 7:30. we will also be making one stop along the way for everyone to regroup, but this will not be a long stop. no one wants to stand out in the cold for too long! 4- don’t forget your lights, helmet, pjs, gloves, water, hot chocolate, and/or a snack if you think you’ll need it. this month’s ride is a little shorter than months before, but don’t think the cold weather means you can’t work up a sweat! know your own body and take care of it so we can see you through to the after party! 5- CORKING. we need EVERYONE to do their part on this. the ride is much too large for designated corkers, so be a dear and help keep us together for a few minutes. if you come to an intersection that is already being corked, feel free to relieve that person to catch up to their friends! don’t forget to be nice to drivers! 6- we will be finishing at Pratt Street Ale House, where we have the first 2 floors for our event. 7 rooms, 5 bars, food and drink available at all. in order to get the drink specials ($2 Natty Boh, $3 Bud Light, $4 Oliver Drafts, $4 Rail Drinks) we will have volunteers giving out HAND STAMPS at the entrances. you NEED A STAMP to get the discount! (and you need to do the ride to get a stamp!) Pratt Street is also donating 10% back to BBP so drink up! 7- at Pratt St we will have some racks available in their courtyard for locking up bikes. we will not all fit in there, however, so many will have to lock their bikes up across pratt street on the convention center steps! please be careful when crossing pratt street. 2 Responses to Pajamboree Updates!